Many brilliant ideas have been developed during hard, economic times. Seize the opportunities that exist during this recession to spark the next big idea. Don’t worry if you don’t have that idea yet; maybe it will surface after reading “Exploiting Chaos: 150 Ways to Spark Innovation During Times of Change” by Jeremy Gutsche, innovation expert and the founder of TrendHunter.com, the world’s largest network for trend spotting and innovation. These laptop duvet covers are quite stylish! 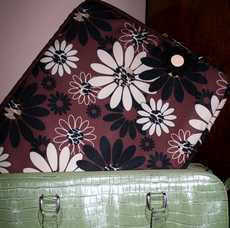 As a laptop bag designer, I can appreciate the fashionable options available for tech-savvy women. Tech-savvy women can now personalize their laptops with these unique trackpad skins. I love having my technology gear reflect my personal style. What about you? The days of the paper resume may soon be over. Thanks to the emergence of new technology, such as Visual CV, we may be able to save a few trees. I stumbled across Visual CV and am impressed with its functionality. It allows you to create your entire resume online. One of Visual CV’s nicest features is the ability to incorporate social networking elements, such as YouTube and Yahoo videos and slide presentations right into your resume. Another cool feature to jumpstart your resume is importing your LinkedIn and Facebook profiles. Visual CV also allows you to import work samples for your portfolio and include a list of references. Wow! why didn’t I think of that!